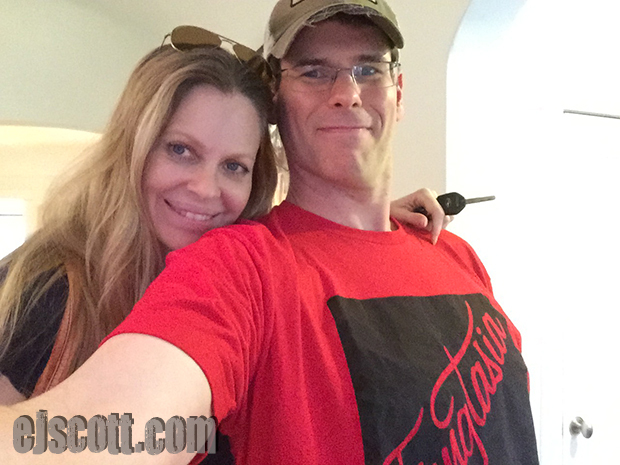 True Bood’s Kristin Bauer van Straten is the guest on the newest episode of EJ Scott’s “Scratch the Surface” Podcast. Its a long podcast, but well worth the listen. During the podcast, EJ learns how Kristin was born Kristin Neubauer and started out in Wisconsin thinking she would be a graphic artist and then one day in her 20’s decided she wanted to try acting. She got an agent by stalking means. She found her husband Abri by MySpace “stalking” him. A great story of how Abri, a South African musician, was in town and Kristin sought him out to …. well you’ll just have to listen. Working on Seinfeld and her moniker of “Man-Hands” on the show. Working with Jerry Seinfeld and Larry David. Working on The Secret Life of the American Teen with Shailene Woodley. Her relationship with Alexander Skarsgård. She sets the record staright about her relationship with Fabio. Losing her father to melanoma. Her passion to help elephants in South Africa and the documentary she is making about it. There’s laughter, there’s tears, there’s stories to remember. and so much MORE!!! Its a long one but its a great one. Please Listen! Donate directly and safely to the Choroideremia Research Foundation by credit card or Paypal using the PayPal button here below. Donations are tax deductible for US residents. I am a huge fan of Kristin miss her so much this summer seeing her along side alexander skarsgard they were the best together ! I MISS TRUE BLOOD THIS 1ST YEAR SO MUCH ! I hope Kristin still speaks to alex I never see pictures of them anywhere together anymore all I see him now is with his bone skinny heavy smoking girlfriend alexa chung I hate to place judgement on her but that is what I see when I look at her she always smoking and it looks like she never eats at all ! WOW he likes them thin thin boy ! I lost so many people I love from smoking how anyone can smoke today is just out of there minds to me I just don’t get it at all I think alexander can do better this girl is ok at best and in the past he seemed to have all beautiful girls I just don’t get this at all perhaps his type has changed Big TIME who knows ! I Know how much he loves his country I thought he would marry a girl from Sweden ! I kind of look at him differently now to me behind every man there is a classy girl and I am sorry to say but she is not it at least in my eyes I use to look up to him so much not any more it hurts me to even say that but its true sadly ! Kristin is the best god bless her with all she does she seems like a CLASSY BEAUIFUL LADY with a heart of gold miss her so much I wish her only the very best !